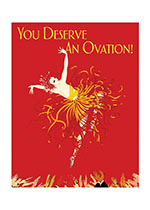 OUTSIDE GREETING: You Deserve an Ovation! Amazing colors and clapping hands express congratulations in this beautiful card. The image comes to us from a fashion illustration.